If you are a bride-to-be wondering where to start with your wedding lehenga research, this post is just the one for you. 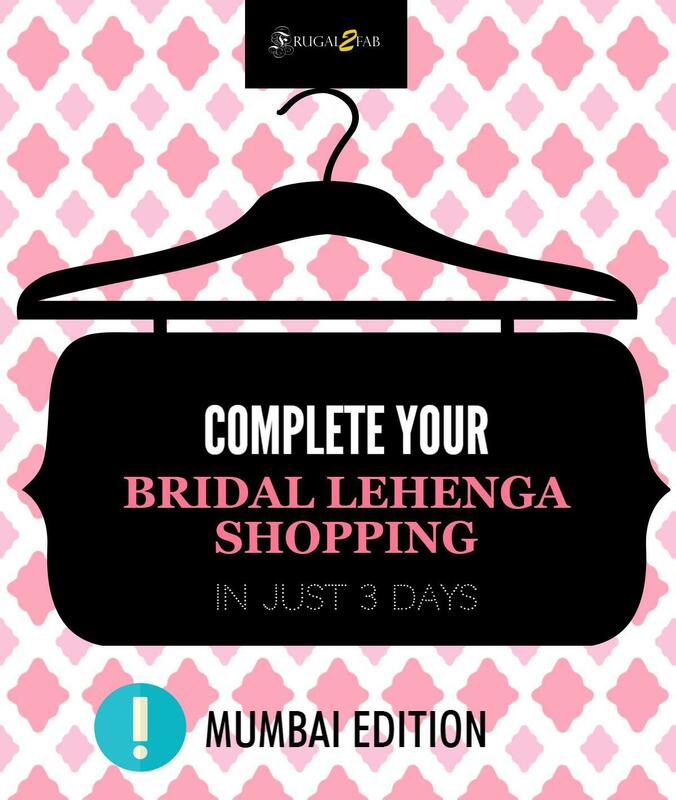 I assure you, you will find your bridal wedding lehenga in Mumbai in 3 days. How so? Its simple. If you are shopping in Mumbai, luckily there are only 2-3 locations where one can shop for bridal lehengas. Plan your day well, and you will be able to see most of it in a short time. Bridal lehenga shopping is a challenge for every bride. We all want the best piece at the least price. Sometimes we have a particular outfit design, look in mind…and we spend days and months trying to get that. Most of the times, this exercise of that one dream lehenga is super-duper tiring, frustrating and emotionally draining. Often we think that lets just increase the budget and be done with it, or we are totally confused with designer options. If you are paying a heavy price, you might as well get the best one right? I am here to help you with your bridal lehenga shopping. I got married 6 months back, and I almost took the same time to finalize on my wedding lehenga. Yes, it took me that long…only because I was on a shoe-string budget. Think 30k max. I finally stuck to my budget but it took me forever to find that one piece. Pinterest first because, I want you to sit back and think what are you willing to pay for that particular bridal lehenga which you loved. You can check out Frugal2Fab’s Pinterest Board on Bridal Lehengas for inspirtation. Now justify the price you’re willing to pay for the look, and then move over to the online shops. These portals will give you an idea of how mis-matched you are with your lehenga price expectations. Now that you have done that, the next step. Don’t cry and feel miserable. Even if your budget is 10k, there are a world of options out there. Its just that you will have to put in some efforts to find that gem. Meanwhile, if you are someone whose budget is 1L or so, good luck to you. Your life is going to get tough, coz there are infinite more options (read designers) to pick from. No matter what your lehenga budget, stick to it. Do not cross it ANYHOW. If its 40 it should mean 40, not 42 not 45 definitely not 50. This chart works on multiple levels. If you want to see what all is out there, 3 days and you will more or less complete visiting the best of the bridal lehenga stores in Mumbai. That said, if your budget is 30k, I would seriously recommend stick to say Day 3 stores only. You don’t want to look through good expensive pieces and then see the lower priced ones. You will not be able to make your pick. So depending upon your budget you can move your itinerary. If you want to do some window shopping prior to picking up your wedding lehenga, then stick to the day1 day2 day3 routine. The only reason why I have put the expensive stores in the first 2 days is..because sometimes they keep some lucky pieces on discount which may just fall in your price bracket. Why to miss an opportunity, right? Mind you, there is nothing ‘lucky’ as such about a discounted lehenga. You really have to be careful if you find one say at 50% or 80% discount….check every inch of it. Stitching, sequins etc…if its not too spoilt, only then invest in it. Just to give you an idea of what kind of lehengas you can find at these stores…take a look at some of these bridal lehenga options. Honestly. they have displayed probably the worst collection online. All these stores are very picky about sharing pictures of their ‘one of a kind’ bridal lehengas. So the only way to see their good options is if you find a bride who has shared her wedding pictures online…or go to the store to see the real bridal lehenga options. If you are running short of 10-15k from getting your dream lehenga, I would advise try looking for the laccha (Lehenga-Anarkali) options as well. Ask them to show you these also in the heavy range. The minute you step aside from lehengas, you will be surprised at how much the price can differentiate. Just have a look. See the difference in the pricing between lehenga and laccha? Both look equally bridal, and if paying more than double doesn’t justify, I am with you on that. Aza is a multi designer chain which showcases India’s best designers outfits in their stores. Best time to visit this place is when they have a sale on. Very slim chance, but you may just find what you’re looking for at a big discount. Its really hard to find designer bridal lehenga prices. I just spent like one full hour and found barely some lehengas having prices on them. Most of these chain stores keep like the worst options online. Its only when you visit their stores that you will find some serious drool-worthy gems. I am sharing these pictures of bridal lehengas with prices just so you get an idea of what you can get for what price. If you’re not designer crazy, I would insist go for the store lehengas instead. For 50k-60k budget, you can find yourself stunning bridal lehengas. Has this post helped you a bit in your bridal lehenga search? come with approximately all significant info’s.